Buonocore was a secondary striker and attacking midfielder who was even compared to Maradona due to his short size, position and Neapolitan origins. 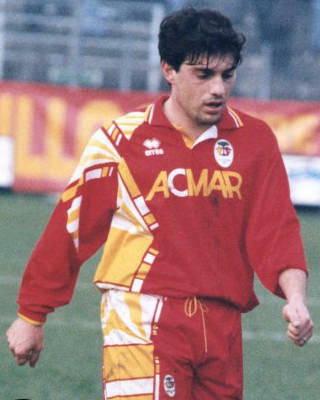 He grew up at Napoli but he never debuted in the first team so he played for Sassari Torres and Latina before joining in 1991 Serie C2 team Ravenna where he became an absolute legend. He was nicknamed "Sommo Poeta" due to his hate for obvious and easy plays. Even Atlético de Madrid seemed to be interested to him at one point. Thanks to his acrobatic playstyle in addition to 8 goals scored in 69 matches he contributed to two consecutive promotions from Serie C2 to Serie B. He transferred to Cosenza where he scored 9 goals in 29 matches becoming a fans-favourite but after only a season he decided to go back to Ravenna due to personal issues. Ravenna was in Serie C1 and Buonocore helped again to the Serie B promotion. This time he stayed at Ravenna in the Italian second flight for two seasons before joining Serie A team Venezia. Unfortunately he only played 6 matches and was sold to Serie B club Ternana. After two not good seasons he went back to Serie C2 at Messina and here he did what he did at Ravenna, helping the Sicilian team gaining two consecutive promotions from Serie C2 to Serie B. After 72 matches and 6 goals in four seasons, at the end of the last one he broke the meniscus so here his career started its slow decline. After leaving Messina he played for Ravenna, Frosinone, Ancona and many other minor teams and retired in 2012. Buonocore's qualities were considered to good for a Serie C player and in fact he found himself in Serie B he gave great performances thanks to his tricks and flashes of brilliance that he made with his fairy left foot; he was very fast with the ball on his feet, could dribble his opponents with agility and was also a good free kick taker; at Messina he often played as attacking midfielder to give the forwards excellent passes. Messina's supporters remember him especially for a goal at the top corner he scored against Ternana and another one he scored against Palermo after dribbling the entire defence. When he played far from Ravenna he also had a weird attitude due to the distance from his family: one day while playing at Messina he left the city with no explanation to go find his family and went back to Messina later that same day.